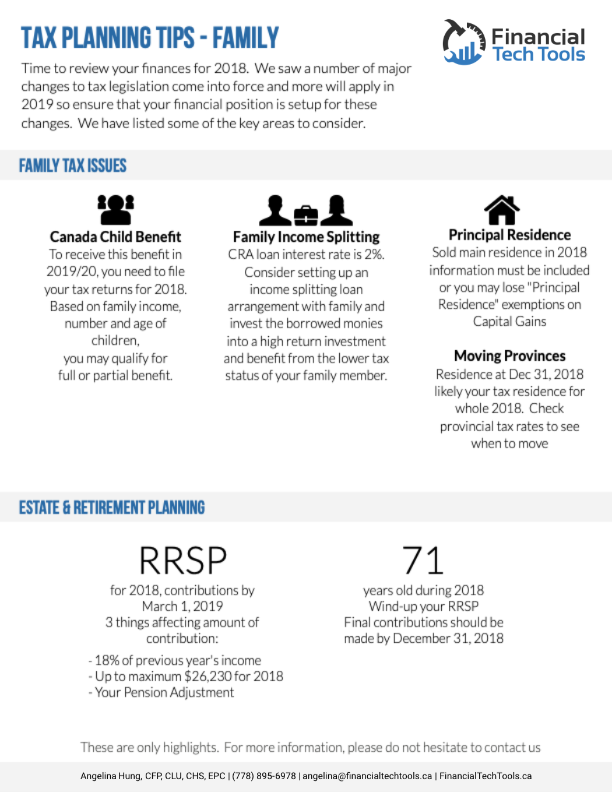 Given all these changes, it’s a great time to remind clients, prospects and COIs (Centres of Influence) about getting everything in order to ensure you have your finances lined up. For the small business owner, it’s worth having a review prior to the implementation of these changes in 2019. Make sure you share this on your website, social media and email marketing. 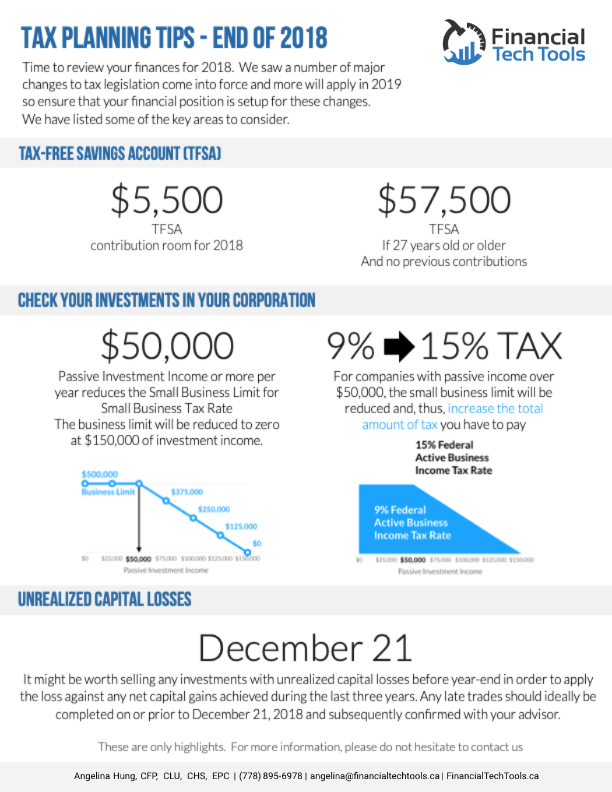 It might be worth doing this before year-end in order to apply the loss against any net capital gains achieved during the last three years. Any late trades should ideally be completed on or prior to December 21, 2018 and subsequently confirmed with your broker. Conversely, if you have investments with unrealized capital gains which are not able to be offset with capital losses, it may be worth selling them after 2018 in order to be taxed on the income the following year. 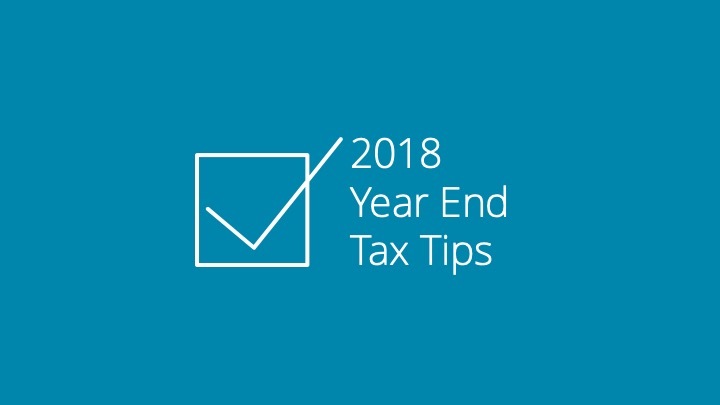 If you pay your final 2018 personal tax instalment by December 15, 2018, you won’t pay interest or penalty charges. Similarly, if you are behind on these instalments, you should try to make “catch-up” payments by that date. You can also offset part or all of the non-deductible interest that you would have been assessed if you make early or additional instalment payments. The taxable benefit applied to company cars is comprised of two parts – a stand-by charge and an operating-cost benefit. If you drive a company car, it’s worth considering how to potentially minimize both of these elements. 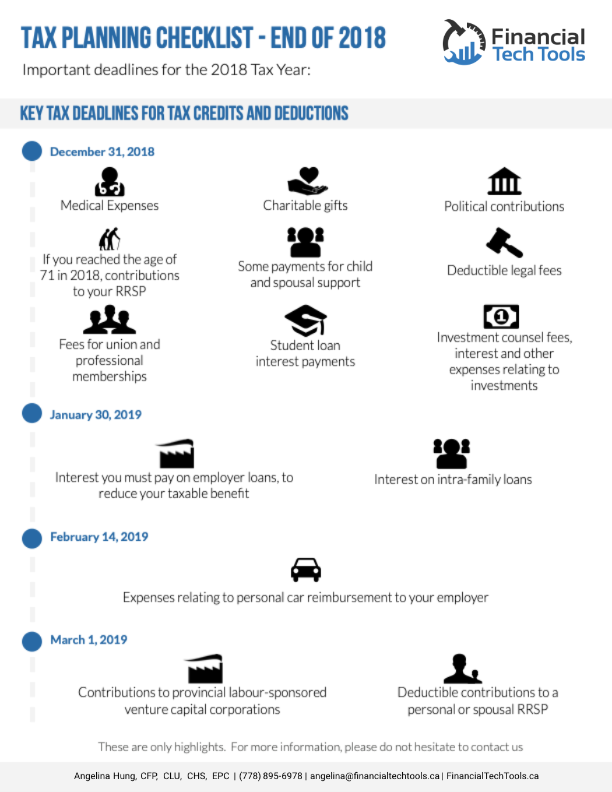 The taxable benefit for operating costs is $0.26 per kilometer of personal use, therefore you should make sure that you reimburse your employer where relevant, by the deadline of February 14, 2019.